Product Description Key Features Spektrum DSMX® receiver with AS3X® technology, installed Powerful 480-size, 960Kv BL outrunner motor, installed 18A brushless ESC, installed Aileron, elevator and rudder servos installed Durable Z-Foam™ construction Oversized tundra tires Leading edge vortex generators Designed to accept the HobbyZone® Super Cub Float Set, sold separately Optional flap servo, sold separately Large, easy-access battery hatch Includes 3S 1300mAh 20C Li-Po battery Includes DC 3S Li-Po fast charger Requires a full-range 4+ channel (5+ channel with flaps) DSM2®/DSMX transmitter, sold separately Needed To Complete - 4+ channel transmitter (5+ channels for optional flaps) Optional Accesories - Float set - Flap servos Overview The full-scale Cub Crafters Sport Cub is an inspired reinvention of the Piper Super Cub that is introducing a whole new generation of aviators to the wonder and excitement of back country flying. The ParkZone® Sport Cub park flyer is a fantastic recreation of this aerial adventure machine that will open a new world of possibilities for RC pilots too. Constructed of durable, lightweight Z-Foam™ material, it shares many of the same aerodynamic features that give the full-scale version its light wing loading and superb short field abilities. Oversized tundra tires for flying off grass and other rough surfaces are included. 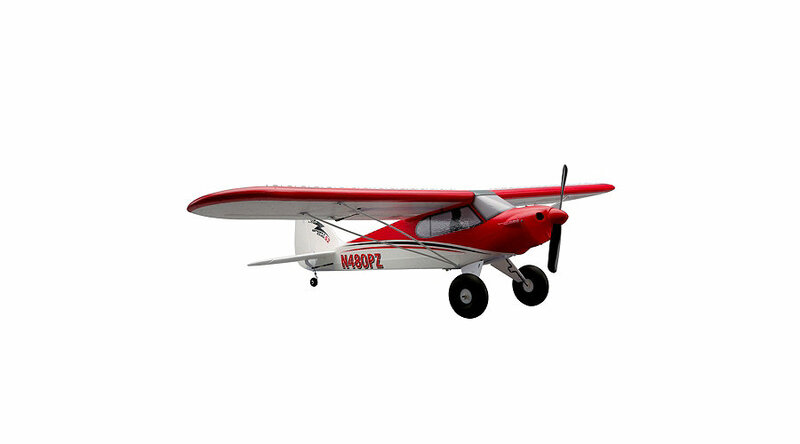 Those in search of the ultimate RC bush flying experience have the option of adding floats and functional flaps. This Bind-N-Fly® version comes equipped with a Spektrum™ DSMX® 6-channel receiver with built-in AS3X® (Artificial Stabilization - 3-aXis) technology. Using a combination of 3-axis sensing and exclusive flight control software, this system counters the effects of wind and turbulence so you can fly low and slow or nail sport landings with amazing precision.